The holiday season is starting early this year..
Floyd Mayweather’s friends from The Money Team Russia gave him a real, live baby tiger to keep as a pet and it immediately made some people really upset. It’s not very nice to want somebody to get eaten by a tiger, Chrissy. Here she is at a show. It’s probably a circus. She’s probably hoping somebody gets eaten by a tiger. She’s into that kind of thing. In the wild, this tiger would spend it’s life running from poachers, and trying not to get eaten by Simba. In the Mayweather Mansion, this tiger is going to live like a king and eventually die of natural causes, a luxury that any other tiger will never experience. If this tiger gets sick, it won’t be left to rot in the hot sun, it’ll get world class medical treatment. 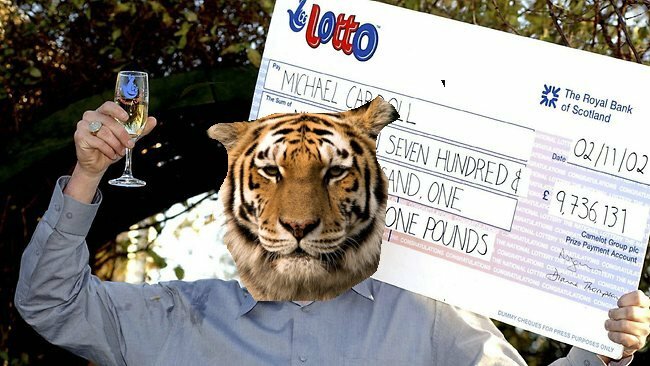 Let’s not act like this tiger is a victim here, this tiger won the goddamn tiger lottery.